Two of the most impressive bridge designs in the world are just 100 km apart in southern France: The Millau Viaduct, designed by Lord Norman Foster, London, and the French engineer Michel Virlogeux; and the Pont du Gard, near Uzes, built between 20 BC and 50 AD (exact dates unknown). The Millau Viaduct is the result of an extended research process by the French government, starting in 1987, through 1995. In 1996 the government selected the design consortium, and in 2001 selected the winning construction contractor. The Viaduct was completed in December 2004. At the time of its construction, the Millau Viaduct was the highest bridge in the world. Personally I consider this result to be a perfect symphony of artistry and technology, which is why I have selected it to showcase the Quality section of this website. For more information on the Millau Viaduct, there is excellent coverage on Wikipedia, and on the official website for the project. No less impressive, in its own way, is one of the oldest and best preserved of Roman structures: the Pont du Gard, less than two hours drive to the east. What is so impressive about this structure is precision of its slope; the fact that it worked. Besides being the highest structure the Romans ever built (at 50 m.), the waterway slope is only 1/3000. The aqueduct was constructed to bring water from a spring at Eure, about 25 km north of the present French city of Nimes. Because of the mountainous topography, however, the channel has to wind around, and is just under 50 km from the spring source to Nimes. What still intrigues (and baffles) engineers is how the Romans were able to figure out that the source of the spring was only 17m. above the destination. This meant that the average slope over the entire 50 km had to be no more than 0.35 mm per metre. If you’re thinking in inches, 0.35 mm is about 1/100 of an inch slope. Would you like to take on an engineering project today that required that level of precision? On completion, the aqueduct delivered 20,000 cubic meters (44 million gallons) of water a day. The entire structure is made from mortarless stonework, with some stones weighing as much as 6 tons. Interestingly, it is thought that it took 800 – 1,000 workers about 3 years to build the aqueduct – about the same time it took to construct the Millau Viaduct 2,000 years later. If you ever visit this site, be sure to take in the nearby museum, devoted to the construction of the aqueduct. It is superb. Moreover, you can learn about why the aqueduct started failing to deliver its water within only a few hundred years of completion: turns out that corruption was rampant in the Roman bureaucracy. Farmers along the route tapped into the channel for irrigation and paid the Chief Water Inspector to look the other way. Nothing has changed in 2,000 years! 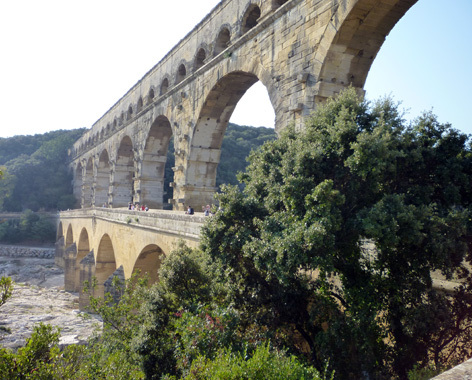 For some great photos of Pont du Gard, see http://www.kuriositas.com/2010/10/pond-du-gard-aqueduct-bridge.html.